In light of the events in Colorado, the gun control debate is beginning to amp up once again. As it should be, out of respect for the victims and their families, the debate has yet to reach its zenith. In fact, gun rights activists have been mostly quiet since the shooting occurred on Friday morning. There is a lot of noise about the shootings and its only beginning to die down. However, there’s been a substantial amount of criticism focused on politicians, both liberal and conservative. Like the above tweet mentions, those in favor of gun control seem to believe that it’s a losing battle. The landscape of gun control is full of complexities beyond whether or not citizens should have the right to bear arms. In 2012, public opinion on gun control reveals a massively polarized public. Across the electorate, supporters of gun rights and gun control are in a virtual dead heat. Around half the nation believes in gun rights, while the other half believes gun control is more important. In addition, guns are a politically polarizing issue. Around 70 percent of Democrats support gun control, while 70 percent of Republicans support gun rights. 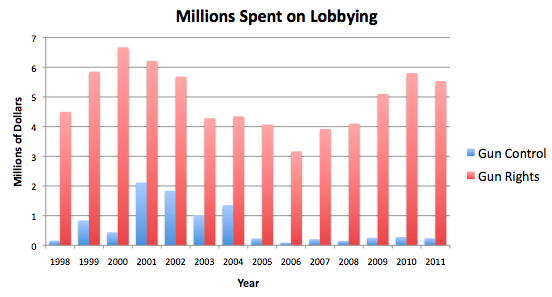 While the debate seems to be evenly divided amongst the American electorate, the discussion is clearly lopsided once lobbyists are taken into account. The gun rights lobby has significantly and easily outspent the gun control lobby since 1998. Beginning in 1999, the gun control lobby began to increase its fundraising efforts. Led by the Americans for Gun Safety Foundation, the gun control lobby hit the $1 million mark in 2001. The organization went defunct in 2004, leaving the Brady Campaign and Mayors Against Illegal Guns as the two largest gun control lobbies. Mayors Against Illegal Guns has been primarily funded by New York City mayor Michael Bloomberg, but his donations pale in comparison to those made by gun rights activists. In the days after the Aurora attacks, Bloomberg has been vocal about starting a national dialogue about gun control. The gun rights lobby consists of several groups that have contributed millions of dollars over a period of several years. Of course, the most visible amongst these groups is the National Rifle Association. The Gun Owners of America and Citizens Committee for the Right to Bear Arms also raise close to or over $1 million dollars each year. That being said, the money raised by all these groups pale in comparison to the money raised by other lobbyist industries. Since 1998, both gun lobbies have raised $78 million. In comparison, the pharmaceutical drug lobby, has raised over $2.3 billion during that same time period. Given the interesting juxtaposition between public opinion and lobbying, it’s interesting to see public opinion on guns from the General Social Survey. 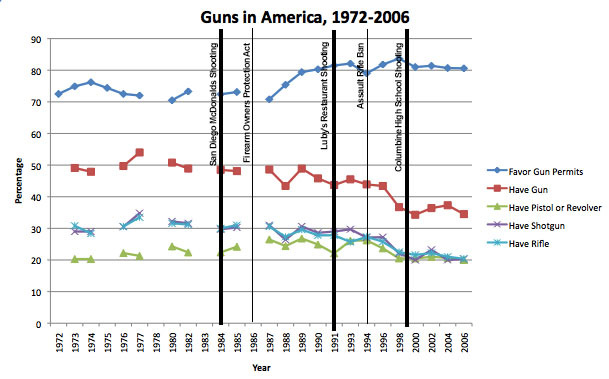 In the last 30 years, gun ownership of all types has decreased. This includes separate ownership of pistols, revolvers, shotguns, and rifles. In addition, an increasing amount of people believe that citizens should be required to obtain a police permit before buying a gun. Although less people have guns and gun permits have gained popularity, there has been a sensationalized amount of attention placed on the issue. 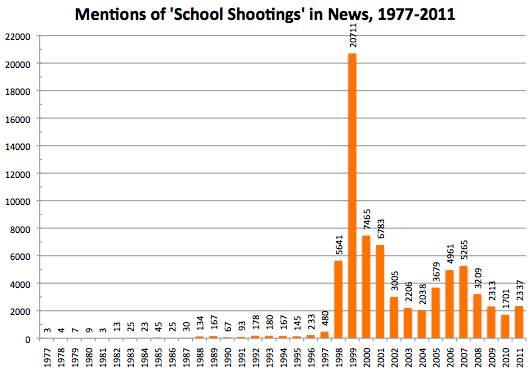 Beginning in 1998, the news media began to place an inordinate amount of attention on school shootings. Between March and May 1998, three different school shootings occurred in three different states. It was these events (principally the Westside Middle School and Thurston High School shootings) that precipitated the attention that the media now places on shootings. The Columbine High School shooting in April 1998 brought massive attention to school shootings and the gun debate, culminating in an unprecedented 20,711 mentions of “school shootings” in the media that year. Since the late 1990s, the media has placed a significant amount of attention on such events. In the aftermath of such horrific incidents, the media tends to offer a number of different explanations for why such events may occur. In the recent days, I’ve heard new arguments about how a “thirst for fame” may have led James Holmes to act. This argument seems particularly relevant in this “reality television/five minutes of fame/privacy threatened” atmosphere. While there is no “fame” indicator in the General Social Survey, the survey collects data about job satisfaction. For the last 40 years, job satisfaction amongst Americans has reliably landed between 80 and 90 percent. It seems realistic to assume that most Americans are not hoping to be suddenly be thrust into the national spotlight. Other than the fame argument, most commentators tend to cite the decline of civic society for a presumed increase in gun violence. This argument is somewhat related to and supported by Robert Puntam’s thesis in Bowling Alone. I don’t argue against the assertion that our conceptualization of civic society is changing. To ignore changes brought on by communication and technological advances would be foolhardy. Americans are engaging more and more with technology and less with other human beings. 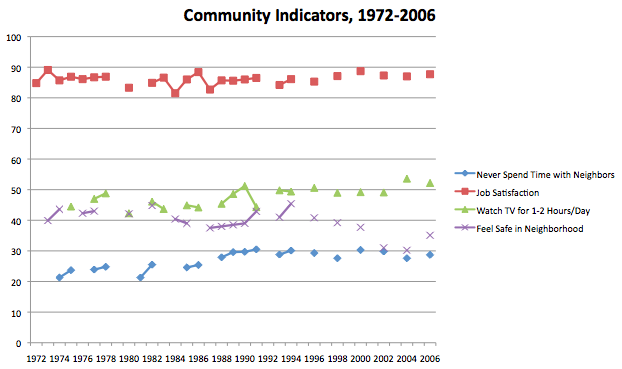 In fact, a cursory overview of community indicators such as the amount of time spent with neighbors and neighborhood safety indicates a subtle decline in Americans’ interaction with their neighbors. But I’m not entirely sure the decline of civic society can explain a presumed increase in gun violence. This finally leads me to consider an argument made by many gun rights advocates. Is gun violence actually increasing in the United States? Before considering the statistics, it is important to emphasize that the only thing better than fewer gun-related deaths is no gun-related deaths. The National School Safety and Security Services has been collecting data on school-related homicides. 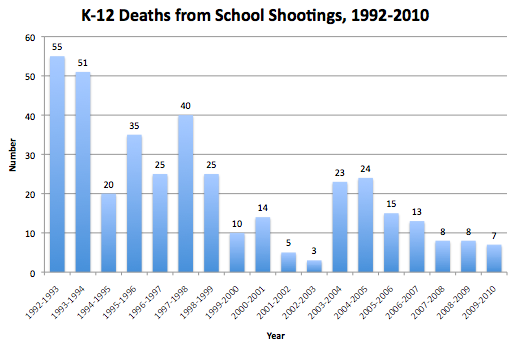 Since 1992, the data show that approximately 21 students per year have died from gun-related violence. In considering the national data, the picture is a little more clear. After peaking in the early 1980s and then rising again in the early 1990s, the number of gun related homicides in the United States has actually decreased. 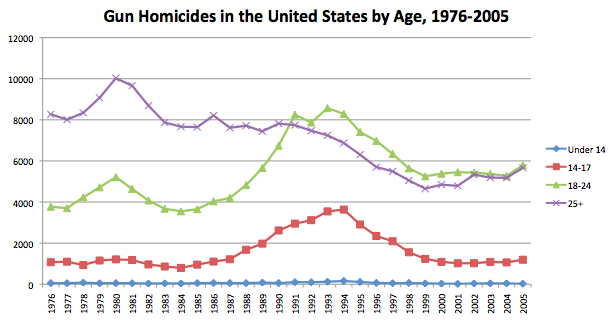 In fact, in the early 2000s, we saw less gun related homicides than from any other time period since 1976. This is not to say that the concern brought on by shootings like Aurora is not warranted. The shooting in Colorado is as despicable an act as any human being could commit. There should and will be an adequate response from our justice system. Our government representatives need to respond by considering potential changes in public policy. Although Congress should be slow to act, the pace at which they have moved on legislation regarding school shootings and gun control has been glacial. 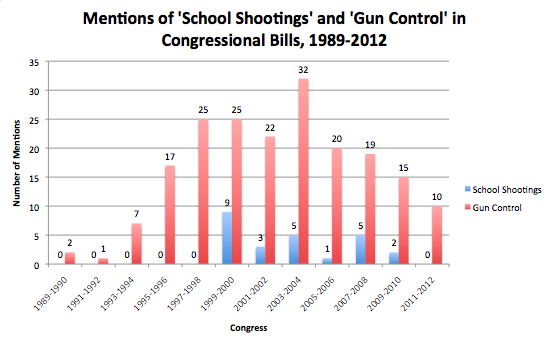 Only 25 pieces of legislation have mentioned ‘school shootings’ since 1989. These 25 bills were only introduced after 1999, after the media began to extensively cover school shootings in the media. Gun control has received more attention in legislation, with 125 pieces of legislation mentioning ‘gun control’. These are relatively rough measures of the attention Congress pays to gun control. However, proponents of gun control would argue that congressional legislation should address the issue more readily. I would argue that any decreases that we’ve seen in gun-related violence is not due to Congress or government legislation. Rather, our heightened awareness of guns, community vigilance, and changes in law enforcement procedure has probably done more to assuage gun-related deaths than any legislative action. The next couple weeks will be extremely crucial in determining how any future legislation can further alter gun-related violence in the US. Mario Guerrero is associate professor of political science at California State Polytechnic University, Pomona. He teaches courses in American government and specializes in political communication. In 2017, Guerrero was elected president of the American Political Science Association’s Latino Caucus and was named a RAND Faculty Leader Fellow. Guerrero is faculty advisor to the Political Science Club and Hermanos Unidos. Guerrero is also a Ford Foundation Fellow and is the recipient of numerous campus-wide and departmental teaching awards. Research Interests: political behavior, elections, campaign finance, voting, political communication, social media, new media, teaching.